4.2 out of 5 based on 67 bloggers and 16 commenters. Brownline is a free blogger template with 3 columns, magazine-styled, right sidebar, web 2.0 design, rounded corners and gradients. Excellent template for blogs about internet. 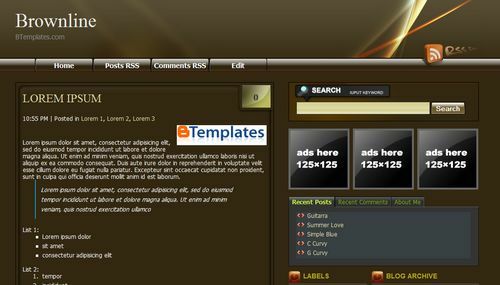 thanx mate for this amazing template..but i have a strange problem in using it..
large Images and long urls are extending out of the blogger post section to sidebar section..
damn…..large images and texts are overflowing to sidebar..
alguém pode me dizer se tem como eu colocar esse codigo junto com o post?pq sempre q coloco ele avisa q da um erro q n posso colocar esse codigo,sera q tem algum codico com essa mesma funcao que de certo? I am having a new problem. no window ever shows up! I have tried with firefox and internet explorer. Please tell me how to remove icon- your Ad here ? Oh it’s what i was searching. how do I change the banner image in the sidebar? is it possible to deactivate the Borderline around of images at the articles?